He was appointed consultant of an orthopaedic and traumatology with 40 of orthopaedic beds at a teaching hospital in 2007. Teaching is natural part of his responsibility, as well as training younger colleagues in all fields of orthopaedic and traumatology mainly spine surgery. All of his medical activities are driven by the principles of evidence based medicine. In addition, he attended consultant calls for the department of trauma intensive care unit and respond to emergency to calls outside and inside the hospital, including emergency room calls. 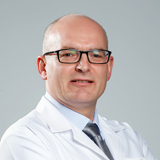 He has presented a lecture in the year 2011 at AO Spine Poland and was a lecturer at the polish society of spine surgery. Member of: AO Spine, Polish Spine Society, Euro spine Member, North American Spine Association, Polish Orthopedic Society. Polish, English, Basic of Spanish and Russian.